A thought on these recaps: I haven’t really settled on a way to do these season recaps for TV, which is part of the reason I was unsure about reviewing TV stuff, but I just can’t leave it, you know? So, bare with me while I figure out my voice for TV ;). Season 2 Hook: A bunch of geniuses freelancing their skills doing part time work for Homeland and Paige and her kiss? Yeah, I have to find out what happens because that’s just . . . yeah. And I’m curious to see more into this bunch of geeks. Season one left with our crew of geniuses saving their fearless leader from plunging to his doom, in a Ferrari, off a cliff. The tension, the climax, and then a declaration of love to an out-of-it Walter O’Brien! On that note, we lead into Season 2 with Walter on the mend, not quite 100% yet, with doctor’s orders to take it easy. But who has ever taken things easy? Especially when you’re not used to taking it easy. As with any good television show, you’ve got to have your minor story arcs and Walter and Paige is center stage in this series. Walter is brainy, obviously, and has a very low emotional IQ, again obviously, and yet with Paige understanding these idiosyncrasies has started to develop feelings for Walter. Of course, Walter is in the same boat, but being the logical and rational person he is, he lets those dictate most of his thought process when it comes to Paige. And it continues into this season. Thoughts: This plot line is pretty interesting. I mean, we all can appreciate a blossoming romance right? Especially when it’s one of those yin and yang type, the opposites attract type. And Walter and Paige fits that m.o. to a T, but then it fades into the background, once again, and Season 2 leaves us with Walter chasing after Paige this round. I’m still processing on how I feel about this. I mean, I get whole wanting the relationship to develop across seasons so they both can get to know each other thing. Plus, Walter had a lot of things to process on his own. So, I get it. I’m just trying not let myself think it’s getting overplayed. We see the push and pull with this pair throughout season one and well, they take off in season two. Thoughts: I love this development. Toby and Happy. Who would’ve thunk it? I like how Happy is kind of dropping her walls around Toby and they’re actually testing out a relationship. They’re fun to watch. We know that Meg, Walter’s sister is fighting multiple sclerosis. It’s rough and she’s not doing to good. She’s getting worse. And sadly, the disease wins. Thoughts: Tears! That’s all I have to say. Tears, tears, tears! I mean, sniffs, I really wanted to see her pull through, make a miraculous recovery due to the genius of her brother, and live happily ever after with Sly, but the logical and rational part of myself knew that this was a pivotal point for our team of geniuses. It opens up the crew to emotional processing, especially for Walter O’Brien. It hits and it hits hard. Those are the major story arcs dotting the exciting parts of solving major catastrophe’s or stopping an international conflict. So, in addition to our favorite core team, there are a couple of newbies. Ray Spiewack (Kevin Weisman) – Someone Walter meets while doing community service as his sentence for reckless endangerment (the Ferrari over the cliff? Yep). He ends up staying at the warehouse while he figures out what to do with his life. And I love him! He lightens the mood around the cast of characters and balances out the dynamic of the team. Tim Armstrong (Scott Porter) – Cabe brings him in on one of their later cases and joins the team as a second Cabe, so to speak. Or, more like if Cabe’s the Captain, Tim is his lieutenant. And I love this addition too, though I’m still cautious on whether I like him joining the series semi-permanently. Firstly, Cabe needs help when it comes to the security of Team Scorpion. He can’t do all the heavy lifting by himself and it’s about time they bring in an extra hand to help him with that. 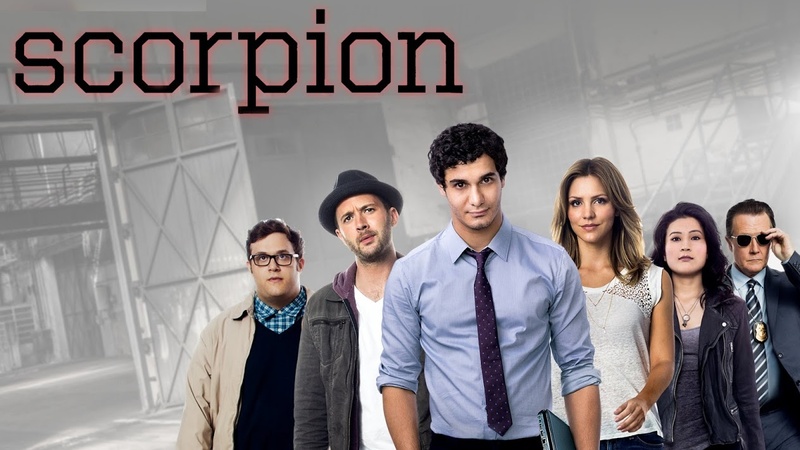 Scorpion can do a lot of things, but sorely lack in hand-to-hand combat or shooting a gun type of skills and some of the cases they take on for Homeland or other big jobs, Cabe could use that extra hand. Season 2 – Overall: It was a pretty good season. There was lots of stuff happening. Sylvester’s marriage to Megan, Happy and Toby’s growing relationship, and the addition of Ray and Tim. I’m loving the way things are going, even though I’m super sad about Meg. I mean, Cabe and Walter speed dating? Love it. And we see Walter really trying. Befriending Ray, trying to date, actually dating (even though it wasn’t Paige). He’s trying. The whole team is trying new things and I love seeing their development. I am nervous with the way season two ended. I am so anxious to see how Toby and Happy moves forward with that shocker and I want to see how Sly moves on. He was able to experience love and companionship. He found someone who spoke his language. And while he’s taken Meg’s death much better than his companions, and his brother-in-law, I want to see how his future turns out. Favorite Episode of the Season: I don’t know if I have a particular favorite in mind, more like a compilation of favorite moments, but if I have to choose one episode I would have to say Season 2, Episode 7, “Crazy Train.” Directed by Jeff T. Thomas, written by Kevin J. Hynes & Nick Santora, this episode was my favorite because of the fact that Ralph was on the train and he was able to show off his mad skills in front of everyone who teases him or treats him differently. I mean, there was a lot of Ralph moments that I love, but something about moving trains at top speeds and Ralph helping stop the train. Yeah, I liked this one. So, I’ll be patiently waiting for Season 3 and hoping this series can make it past Season 4. I think they could and I hope they can.